There are several research areas within the DNA group. A brief description of each is given below. DNA lattices are a great example of how large structures (1mm) can self-assemble from nanoscale components (10nm). If the sequence of bases is designed correctly four strands can be programmed to form a cross structure, known as a Holliday junction. This is the basic builing block, or tile, which will make up the lattice. By including sticky ends on the arms of the Holliday junction that are complementary to one another the tiles can join together to form larger structures. 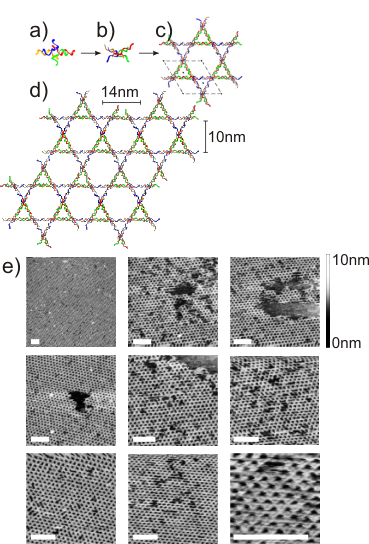 These two dimensional lattices show long range order and can be used to hold other components in a well defined pattern allowing three dimensional reconstruction from transmission electron microscopy images (Malo et al. 2005). Figure 1: Schematic of the Kagome lattice assembly. 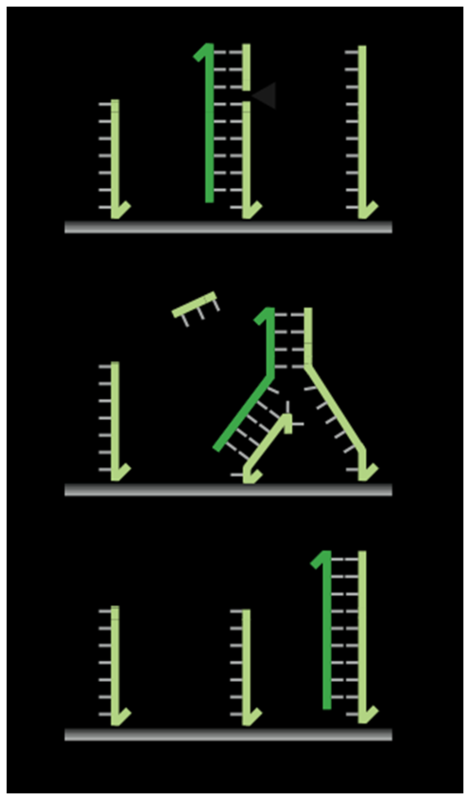 A Holliday junction is formed from four DNA oligos (a) which take on a cross stacked conformation (b). The connectivity of these tiles (c) means a Kagome lattice is formed. The unit cell is denoted by a black parallelogram. In the extended lattice (d) the three double helices which interweave to from the lattice can be seen. (e) Atomic force images of Kagome lattices. The scale bar is 100nm for all images. DNA can also be used to make three dimensional structures. The tetrahedron is an intrinsically braced structure on account of the triangular faces. 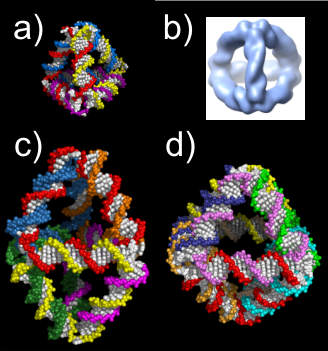 This means that DNA tetrahedra are rigid, nanoscale, three-dimensional building blocks (Goodman et al. 2005). The cavity inside them can be used to hold cargo such as a protein (Erben et al. 2006). The ability to open and close the tetrahedron (Goodman et al. 2008) opens up the intriguing possibility of using them as drug delivery vehicles capable of protecting the cargo and releasing it in response to a targeted signal. Figure 2: (a) The DNA tetrahedron. (b) A three dimensional reconstruction of the tetrahedron from TEM data. (c) The DNA bipyramid which has a greater internal volume to face area ratio than the tetrahedron. (d) The DNA octohedron. DNA can be used to create tracks, fuel and cargo. Motors can be powered by the energy available from DNA hybridization (Green et al. 2006, Green et al. 2008), or from DNA hydrolysis (Bath et al. 2005, Bath et al. 2009). Challenges in motor building include creating a rigid track to stop the motor jumping along tracks, a motor which is directional and processive, and inclusion of a power stroke. Figure 3: A schematic diagram showing how the cargo (dark green) is transfered from one stator (light green) to the next in an enzyme-powered "burnt bridges" motor. Kinesin is a homodimeric protein motor which walks in a hand over hand manner along microtubule tracks. It is used to move vesicles and other cargo around the cell and plays many different roles in the cell division cycle. We are using DNA scaffolds to control the stoichiometry and geometry of kinesin motors to create well defined nanoshuttles. 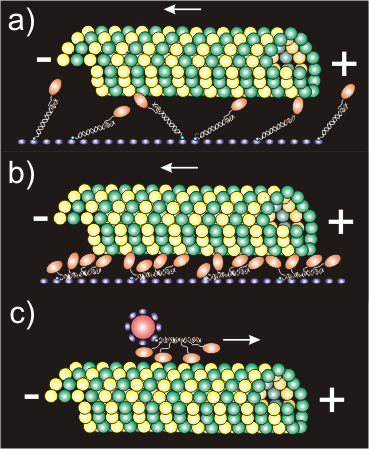 Figure 4: (a) Microtubules glide on top of a surface of teams of single kinesin heads. (b) Several single heads can be linked together by DNA to form teams of heads. (c) Individual teams can be tracked using quantum dots. P Wang, G Chatterjee, H Yan et al. J Jin, EG Baker, J Bath et al. MA Baker, AJ Tuckwell, JF Berengut et al. TE Ouldridge, JS Schreck, F Romano et al. W Meng, RA Muscat, ML McKee et al. MA Boemo, AE Lucas, AJ Turberfield et al. S Simoncelli, E-M Roller, P Urban et al. R Schreiber, I Santiago, A Ardavan et al. Guiding the folding pathway of DNA origami. KE Dunn, F Dannenberg, TE Ouldridge et al. F Dannenberg, KE Dunn, J Bath et al. F Dannenberg, M Kwiatkowska, C Thachuk et al. AJM Wollman, C Sanchez-Cano, HMJ Carstairs et al. Programmable energy landscapes for kinetic control of DNA strand displacement. RRF Machinek, TE Ouldridge, NEC Haley et al. A clocked finite state machine built from DNA. C Costa Santini, J Bath, AM Tyrrell et al. Optimizing DNA nanotechnology through coarse-grained modeling: a two-footed DNA walker. TE Ouldridge, RL Hoare, AA Louis et al. TR Wilks, J Bath, JW de Vries et al. RJ Adamson, TH Sharp, DN Selmi et al. Combinatorial displacement of DNA strands: application to matrix multiplication and weighted sums. Non-covalent single transcription factor encapsulation inside a DNA cage. R Crawford, CM Erben, J Periz et al. Small molecule signals that direct the route of a molecular cargo. Sequence-specific synthesis of macromolecules using DNA-templated chemistry. PJ Milnes, ML McKee, J Bath et al. ML McKee, PJ Milnes, J Bath et al. A DNA-based molecular motor that can navigate a network of tracks. SFJ Wickham, J Bath, Y Katsuda et al. CC Santini, J Bath, AJ Turberfield et al. Remote toehold: a mechanism for flexible control of DNA hybridization kinetics. AJ Genot, DY Zhang, J Bath et al. Peptidomimetic bond formation by DNA-templated acyl transfer. ML McKee, AC Evans, SR Gerrard et al. DNA-templated protein arrays for single-molecule imaging. DN Selmi, RJ Adamson, H Attrill et al. Reversible logic circuits made of DNA.